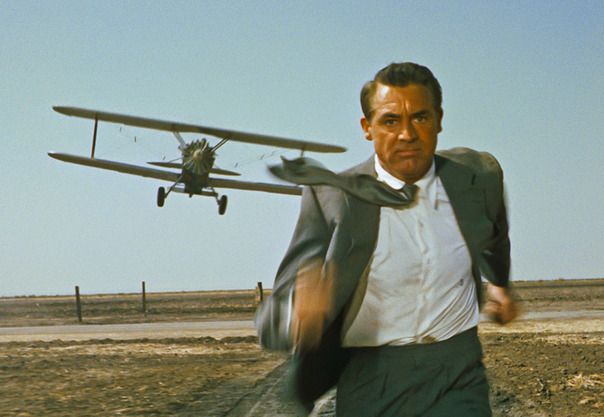 In diabolical plot twists that even Cary Grant found difficult to follow, he is confused by the rapid-fire events that happen to his character. He plays advertising executive, Roger O. Thornhill. Yet he winds up in a labyrinth of mystery and murder when an enemy espionage group mistakes him for George Kaplan, an undercover agent who really doesn’t exist. Or, does he? Without realizing it, Hitchcock said Grant was using a line of his own dialogue from the movie. It’s not the only deception going on in the film. The spies believe that Thornhill is Kaplan. They kidnap him and take him to a Long Island country estate owned by Lester Townsend. He meets who he believes is Townsend, Philip Vandamm (James Mason), and his personal secretary, Leonard (Martin Landau). His captors keep peppering “Kaplan” with questions. When they fail to get any information from him, Vandamm’s goons force whiskey down Thornhill’s throat. They put an extremely intoxicated Thornhill in a car. Their scheme is to have the ride and Thornhill’s life end after the car goes over a cliff. But, as drunk as Thornhill is, he manages to escape. A police car pulls up, and the bad guys quickly drive off. No one, not even his mother, believes his story. Thornhill attempts to unravel the lies. He learns that Townsend is at the United Nations. At the U.N., Thornhill discovers that Townsend is not the man who held him captive. Enemy spies kill Townsend and frame Thornhill for his murder. On the run again, Thornhill hops aboard the 20th Century Limited bound for Chicago. There, he meets Eve Kendall (Eva Marie Saint) who helps him hide from the authorities. When they arrive in Chicago, Eve tells Thornhill she’ll call Kaplan for him. Then, she gives Thornhill instructions to meet Kaplan at Prairie Stop, which turns out to be in the middle of nowhere. He waits in the harsh, hot daylight. Another man waiting for a bus at the same stop notes that a crop-duster plane is dusting where there aren’t any crops. After the man boards his bus, Thornhill realizes that the crop-duster is flying his way and zeroing in on him. Again, the bad guys fail to eliminate him. Thornhill returns to the hotel. He finds out that Eve works with the spies and is Vandamm’s mistress. When he discovers later that Eve is an undercover agent, he realizes his actions have put her life in jeopardy. He warns Eve and helps her escape certain death. The spies are hot on their trail as Thornhill and Eve scale the shadowy heights of the Mount Rushmore monument in an effort to elude them. As the pair scramble back down the face of the stone carvings, Thornhill tells Eve that if they get out of this alive they should get back on the train together. He’s talking marriage. 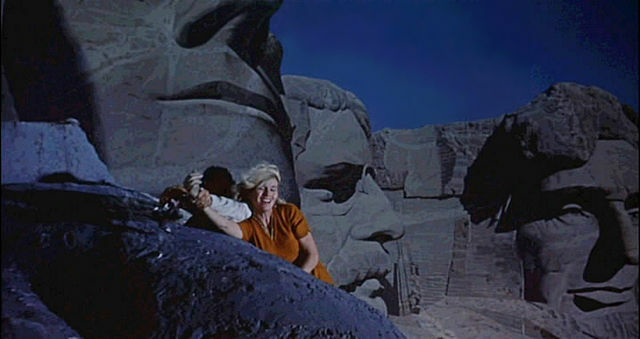 As they hang from Mount Rushmore, Eve asks why his two previous wives divorced him. “I think they said I led too dull a life,” (Grant) Thornhill says. I will be on the lookout for this classic, Judy. Thank you for the reminder. Love this film, Mark. I hope I didn’t give too much away. Enjoy! Oh, you were a bit of a spoiler, Judy, but a classic like this is out there already! True. I just realized – after posting – that this film is 55 years old this year. It still holds up very well. Gosh, you can’t watch that after a margarita! Kate, I made the change you said you intended. I wasn’t sure if you were having fun with Roger/Cary’s circumstances in the film. 😉 Thanks for letting me know. Jessie Royce Landis, who played Cary’s mom, was only eight years older than Cary. In the restaurant scene late in the film (a scene in which a gunshot is fired), look closely before the shot is fired and you’ll see that at one of the tables there’s a little kid who is holding his ears because he knows the shot is coming. In Francois Truffaut’s interview with Hitchcock, Hitch said a scene after that is one where M-G-M pressured him to eliminate a whole sequence at the end of the picture. 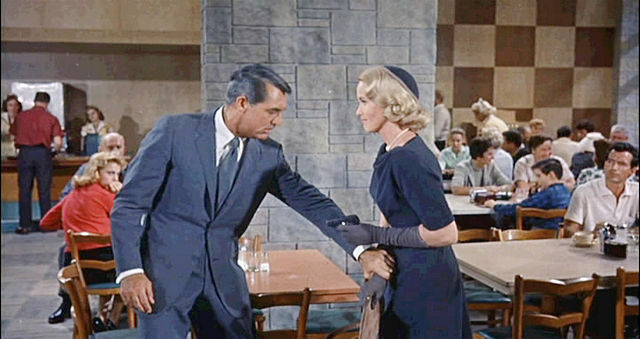 The one where Cary Grant is taken to the woods to meet Eva Marie Saint – their first meeting after the shooting. Hitchcock refused, saying it was a key scene. Imagine the film without that meeting. One of my favourite films. Phil and I could watch it over and over. I love the crop dusting scene. I saw that movie! A classic! And the worst loneliness is when NO ONE believes you. Only Hitchcock could pull off the “making you believe” of this film, and he took his time doing it. But the wait was worth it. Cary Grant was the quintessential actor in this part. Hitchcock was brilliant. Do young people watch his films today, and if they do, what do they think of them? If they take film courses, they definitely should. That’s where I got a greater appreciation of his work, although I was a fan before. Others have re-done some of his films. The remakes were never impressive. Hitchcock had great techniques for lighting,casting, building suspense. I agree. Contemporary film makers tend to think it’s all about the plot and fast pace. But then, who could equal Hitchcock’s quirky understanding of how light and shadow create suspense? These classics keep one riveted to their seat, eyes wide and ears perked up….just can’t afford missing any of the dialogue. Hitchcock was the greatest. Judy, have you watched ‘Marnie’? I totally agree, Mal. I have seen “Marnie.” It was a great psychological thriller. Loved Tippi Hedren and Sean Connery in the film. Wow, even this explanation is a bit complicated. I’ve never seen this one. In all honesty, I’m not really good about sitting down and watching movies, I should probably give this one a try though. I’ll have to check if the library has it. This is definitely a great movie and a classic. I had a hard time following along the first time I watched it, but caught on the second time. This movie was not included in the Hitchcock class I took at OCC and that is a shame, I don’t remember all of the movies we watched but I know this was not included. The plot is a little convoluted, but that was part of the “grand design.” Hitchcock loved to keep his audience guessing. I don’t think Doug Brode showed this movie when I took his film class either. But it’s a must see if you love Hitchcock, suspense, intrigue, comedy and romance. I saw this movie in a college film course, but as I read your summary, I realized that I must not have really watched it. Either that or my memory is worse than I thought. I wonder if anyone has ever tried to make a movie in which the actors really have no idea what’s going on, and they don’t find out until the whole thing is edited and done. If you want a great read on Hitchcock, check out Francois ‘s Truffaut’s book. Excellent behind-the-scenes info. Marc Eliot’s “Cary Grant” also had great background that included Grant working in Hitchcock’s films. They didn’t scale it but it did make for some very funny lines. I hope you have a chance to see it. I thought it was really well done. I need to watch this. You got me excited reading this post. Our local library has lots of timeless classics and I hope they got this one. Thanks. Best wishes to you and your family. You’re going to love this movie, Island Traveler. If your library does not have it, you can view it on Netflix or other sites on the internet. This is one of my favorite movies. Blessings to you and your family. One of my favorite Hitchcock films, Judy!! That plane-cornfield sequence is about as eerie as they come– it gives new meaning to the expression “the middle of nowhere”!! A shoot-out on Mt. Rushmore?? Don’t worry, Mr. President, it’s only a nose wound… They don’t make ’em like that anymore– great review!